"Alisa Melekhina was barely a month old when her Ukrainian-born parents left a Moscow airport for the United States. At the time, the newborn had no idea what the future held for her...[S]he is already leading an extraordinary life. Besides getting straight A's on her final fourth-grade report card from the Rhawnhurst Elementary School, she's already an accomplished author... When the youngster is not reading or taking ballet lessons, she is honing her skill in her other love: chess. Under the close eye of her father, Alisa is becoming one of the nation's most dominant chess players in her age group." Acknowledgments: "Alisa Melekhina (twelve years old at the time), who helped give me rare insight into a child chess competitor's perspective on what it feels like to play international competition chess." "The United States team fared poorly, ending in eighth place. But it had the satisfaction of winning its sixth-round match against the Chinese A team, 3 to 1. Alisa Melekhina was a bright spot for the United States, playing well throughout the tournament and collecting a gold medal." "Camilla Baginskaite, the 2000 champion, and Alisa Melekhina are tied for second and third. Irina Krush, another former champion (1998 and 2007), who was thought to be Zatonskih's biggest challenger, is mired in a four-way tie for fourth through seventh... Melekhina and Baginskaite are the only other players not to have lost so far. The two are an interesting duo. Melekhina, 18, is the youngest player, while Baginskaite, 42, is the oldest. What they have in common, as do most of the players in the event, is that they were born in Eastern Europe... In some ways, the field is almost a perfect embodiment of the idea of America being a land of immigrants." "Ms. Krush, part of the bronze-medal-winning American women's team at the 2008 Chess Olympiad in Dresden, tied for third place with 18-year-old rising star Alisa Melekhina in the U.S. Women's Championship, which concluded yesterday at the Chess Club and Scholastic Center of St. Louis." "[T]he year has also seen a lot of activity and positive experiences for her, culminating in a gold medal performance at the recent Women's World Team Chess Championship (WWTCC) in China. Alisa [...] was the only U.S. player to go undefeated." "IM Irina Krush, 25, and the youngest player, Alisa Melekhina, 18, shared third place with 5 1/2 points." LA Times Chess: Dmitry Andreikin wins world junior title by Jack Peters. : 08/22/2010. "Alisa Melekhina, 19, of Pennsylvania [...] tie[d] for sixth place, the best result by an American since 1999." "Thomas Bartell and Alisa Melekhina tied for first at the 2010 Pennsylvania State Championship, held in Philadelphia over the October 16-17 weekend... According to preliminary research, this makes Melekhina the first woman to win the PA State title." "Alisa Melekhina didn't write her first children's book until she was 6, took two full years to graduate Drexel University, and only now, at age 20, is at Penn Law. What a slacker! ... 'I enjoy being the underdog and being underestimated,' says Melekhina, when we asked if her gender or youth led to any misconceptions from male chess players." American Bar Association Student Lawyer Magazine. A Master in the Making: “Head of the Class” profile by Eileen M. Laux. Vol. 4, No. 1, 09/2012. "Alisa Melekhina knows what it means to multitask. She's a published author, a law student, a dancer, and a competitive chess player. And she's only 21. Although currently enrolled in the University of Pennsylvania Law School, she still makes time to compete in chess competitions across the country." "In the future, 'I would like publishers to negotiate with players for using their games or personas during tournaments,' Melekhina says. 'I'm not advocating for absolute ownership rights. If the chess community were to stop analyzing games and sharing information, then it will affect the level of chess play. The game involves innovative moves, which requires human ingenuity for the game to grow. That's the way chess theory develops." Penn Law Journal. Young Chess Master Ready to Make Her Next Move by Sofiya Ballin. Fall 2014. "She credits her parents for her work ethic. Melekhina is the daughter of Ukrainian refugees who immigrated to Brooklyn, NY after the downfall of the Soviet Union, when she was two months old. [Her father] taught her to play chess at 5 years old. After experiencing first-hand the benefits of hard work and persistence, she took a liking to the meritocracy of the game." The American Lawyer. . Debevoise Associate Moonlights as Chess Champion by Nell Gluckman. January 28, 2015. "The Debevoise & Plimpton associate took an interest in chess at a very young age, developing a mind for logic and problem solving. Those skills helped land her a job at Debevoise last October, when at age 23 she became the youngest lawyer at the firm after graduating from the University of Pennsylvania Law School. ... Tony Rich, the executive director of the Chess Club and Scholastic Center, which runs the tournament, says Melekhina is a terrific ambassador for the game. 'Girls in chess are kind of a rare breed,' he says. 'So the fact that she is intelligent, successful in her education path and career, a strong chess player and so personable-I really think that's going to encourage a lot of girls to stay in the game"
Chess Life Magazine. Career Crossroads April 2015 cover. US Chess Federation. What Does US Chess Mean to You? July 15, 2015. Drexel Magazine. Annual Top Forty Under Forty Alumni. Vol. 26, No. 1, Winter/Spring 2016. Debevoise Women's Review. 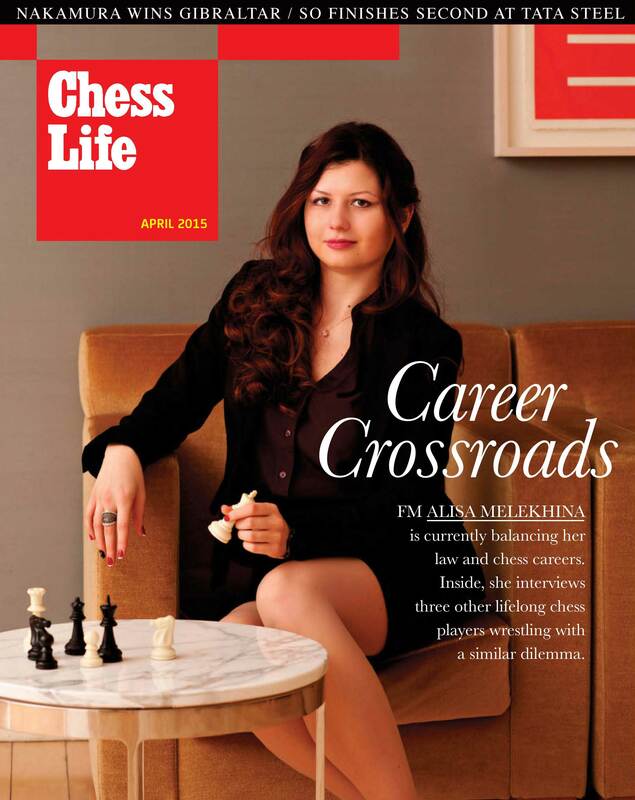 Alisa Melekhina: Chess Champion (and Litigation Associate) by Jil Simon. June 13, 2016. "When I asked if Alisa believes her approach to chess is impacted by the fact that she's a woman, she explained that women are typically, and perhaps ironically, 'aggressive' chess players opting to play more 'attacking' lines. She posited that this may be because the type of women who tend to persevere in male-dominated fields are ones who happen to have a more assertive attitude." Live guest commentary on the World Chess Championships in New York City and chess skills beyond the board. copyright 2017 Alisa Melekhina. This is a personal page for informational purposes only and none of the content herein shall constitute legal advice in any way.